In waters of almost every kind and depth, including the Great Lakes. Recorded up to 8.2 m deep in Michigan, and up to 14 m elsewhere. Staminate plants are much less common than pistillate, and may resemble E. nuttallii vegetatively. The spathe elongates considerably as it matures; on fresh flowering material from Emmet Co. it has been seen as long as 14 mm when the flower is exserted on its long stalk. On pistillate plants there is a tendency for the leaves to be broad, crowded, ascending, and strongly imbricate on short branches. 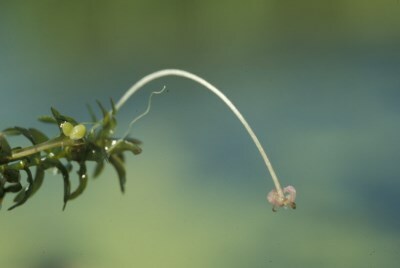 Forms with internodes longer than the length of the leaves may occur in deep water, but the large leaves and stout stem will readily distinguish such plants from the delicate E. nuttallii. MICHIGAN FLORA ONLINE. A. A. Reznicek, E. G. Voss, & B. S. Walters. February 2011. University of Michigan. Web. 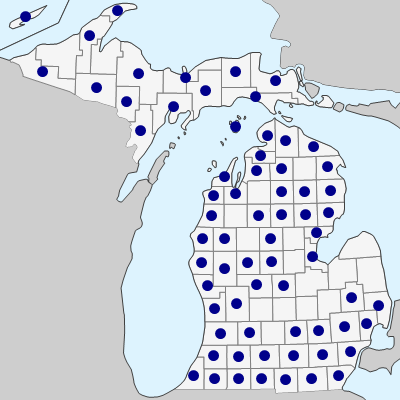 April 21, 2019. https://michiganflora.net/species.aspx?id=1447.